A spirit full of divine Pythia. Huldah was a prophetess mentioned in the Old Testament in 2 Kings 22:13-20 and 2 Chronicles 34:22-28. She was the wife of Shallum, son of Tokhath (also called Tikvah), son of Harhas (also called Hasrah), keeper of the wardrobe. She lived in Jerusalem, in the Second District or Second Quarter. 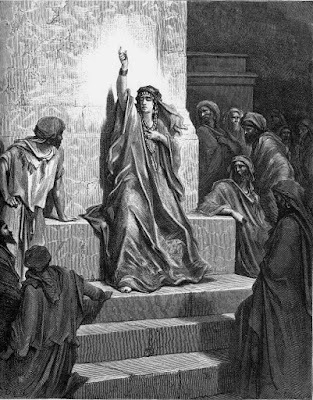 After the discovery of a book of the Law during renovations at Solomon's Temple, on the order of King Josiah, Hilkiah together with Ahikam, Acbor, Shaphan and Asaiah approach her to seek the Lord's opinion. "Go ye, inquire of the Lord for me, and for the people, and for all Judah, concerning the words of this book that is found, for great is the wrath of the Lord that is kindled against us, because our fathers have not hearkened unto the words of this book, to do according unto all that which is written concerning us." So Hilkiah the priest, and Ahikam, and Achbor, and Shaphan, and Asaiah, went unto Huldah the prophetess, the wife of Shallum the son of Tikvah, the son of Harhas, keeper of the wardrobe — now she dwelt in Jerusalem in the second quarter — and they spoke with her. Thus saith the Lord: Behold, I will bring evil upon this place and upon the inhabitants thereof, even all the words of the book which the king of Judah hath read." After authenticating the book and prophesying a future of destruction for failure to follow it, Huldah concludes by reassuring King Josiah that due to his piety, God has heard his prayer and "thou shalt be gathered unto thy grave in peace, neither shall thy eyes see all the evil which I shall bring upon this place". Huldah's prophetic oracle identifies the words the King of Judah heard (2 Kings 22:18) with what Yahweh had spoken (2 Kings 22:19). Therefore, Huldah is the first person to declare certain writings to be Holy Scripture, specifically here being the Book of Deuteronomy. Huldah appears in the Hebrew Bible only in nine verses, 2 Kings 22:13-20, 2 Chronicles 34:22–28. 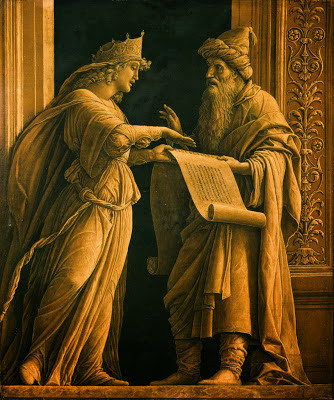 This short narrative is sufficient to make clear that Huldah was regarded as a prophet accustomed to speaking the word of God directly to high priests and royal officials, to whom high officials came in supplication, who told kings and nations of their fates, who had the authority to determine what was and was not the genuine Law, and who spoke in a manner of stern command when acting as a prophet. Nonetheless the Bible does not offer the sort of background information it typically does with other pivotal prophets. Indeed, we are left knowing more about her husband's background than we know of hers, and the little information we know of her personally is largely in relation to her husband. Two conflicting traditions exist regarding the final resting place of Huldah. 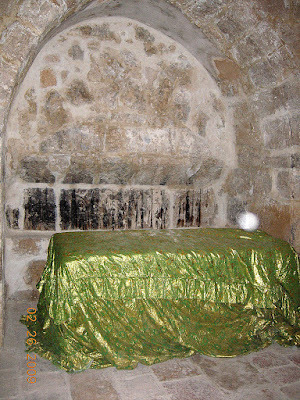 The Tosefta records Huldah's burial site as between the walls in Jerusalem. During the Middle Ages a second tradition developed identifying Huldah's burial site with a cave carved out of the rock beneath a mosque on the Mount of Olives. The cave is considered holy to Jews, Muslims and Christians.